Love, love, love these designer paper balloons. Fabulous card! Ooh! 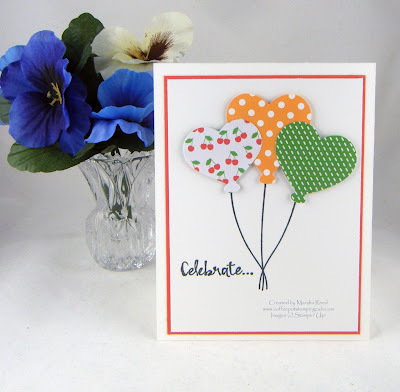 Love how you've used DSP's for the colours - and hearts and balloons - a great combination! Thanks, JoMo! Patterned paper makes it easy to get a small design on images. Marsha, Congrats on being the guest stamper... well earned. I love this card, the balloons are so fun. Thanks, Samantha! I have so enjoyed being a Guest Designer. Wonderful card; great use of the colors! What a fun way to use the colours! Those heart shaped balloons are just gorgeous! Thanks, Emily! They are fun, aren't they?